As an infielder who struggled to hit, Dal Maxvill overcame the odds and started in 21 World Series games for the Cardinals. As a coach with no experience as a baseball executive, Maxvill again overcame the odds and became general manager of the Cardinals. 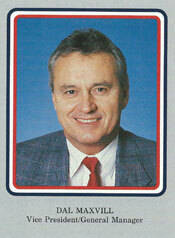 On Feb. 25, 1985, Maxvill was the surprise choice of the Cardinals to replace Joe McDonald as general manager. Maxvill was a coach with the Atlanta Braves when the Cardinals approached him about becoming their top baseball executive. “It seemed a rather sizeable leap to go from third-base coach to general manager,” Rick Hummel wrote in The Sporting News. Maxvill, 46, said he hadn’t applied for the job and was approached by club officials. Team owner Gussie Busch said he was seeking a candidate who knew both baseball and the Cardinals organization and also had business experience. To Busch, Maxvill met the criteria. Maxvill played for the Cardinals from 1962-72. Replacing the injured Julian Javier, he started seven games at second base in the 1964 World Series. He started seven games at shortstop in the 1967 World Series and again in the 1968 World Series. Maxvill won a Gold Glove Award in 1968. He hit .220 in his Cardinals career. Maxvill was a Cardinals coach from 1979-80 and an instructor in 1981. He and former Cardinals reliever Joe Hoerner were co-owners of a St. Louis travel agency. Maxvill earned a degree in electrical engineering from Washington University in St. Louis and worked for a St. Louis engineering company during his off-seasons as a Cardinals player in the 1960s. The Cardinals offered Maxvill a one-year contract. “Of all the people we considered, myself and the other members of the executive committee unanimously agreed that Dal Maxvill has the qualifications we were looking for in a general manager,” Busch told the Associated Press. “We were looking for someone with a sense of business ability to go along with his baseball experience, the innate ability to cope with the business aspects of being general manager,” Kuhlmann said to the St. Louis Post-Dispatch. Two other former Cardinals players _ broadcasters Tim McCarver and Joe Torre _ were considered before Maxvill was offered the position, The Sporting News reported. Schoendienst, a Cardinals coach in 1985, was Maxvill’s manager from 1965-72. On April 2, 1985, Maxvill made his first trade, acquiring infielder Jose Oquendo from the Mets for infielder Angel Salazar and minor-league pitcher John Young. The Cardinals won two pennants, 1985 and 1987, with Maxvill as general manager. Maxvill was Cardinals general manager from 1985-94 until he was fired by team president Mark Lamping and replaced by Walt Jocketty.